Last Sunday morning was another of our monthly football-themed services. 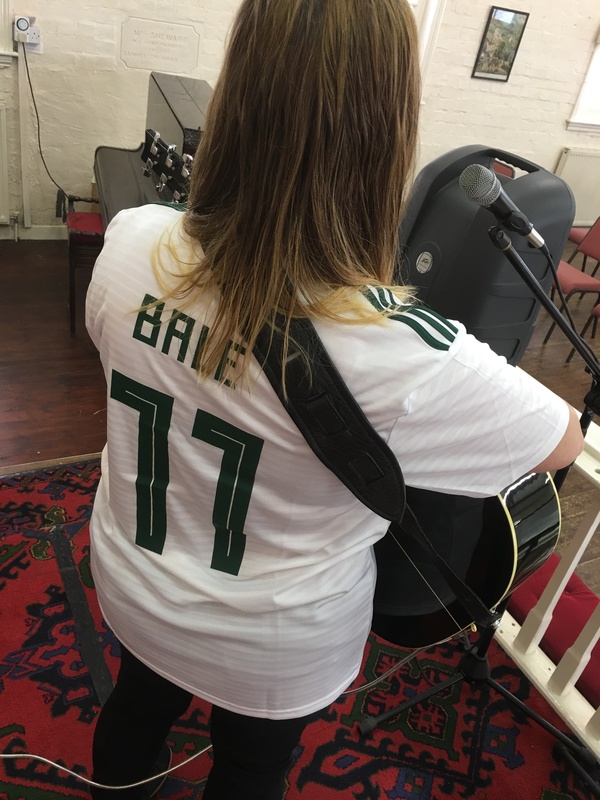 That’s Debby, above, leading worship in a Wales away shirt and more specifically a Gareth Bale one. Wales was represented twice so edged the battle of the shirts this time. A victory on the pitch on Thursday against Republic of Ireland, followed by a Sunday morning at Tipton Family Church. Last month it was Halesowen Town and Wolverhampton Wanderers who led the way with a couple of representations each. This Sunday it’s back to business again, why not join us? The sermons are very practical and if you have never been to church before, you may be surprised at what you encounter. We meet at 10.30 a.m. at Binfield Street Chapel in Tipton. The postcode is DY4 8LS and we would love to see you there.